The Prime Minister, Shri Narendra Modi, visited Kurukshetra in Haryana today. 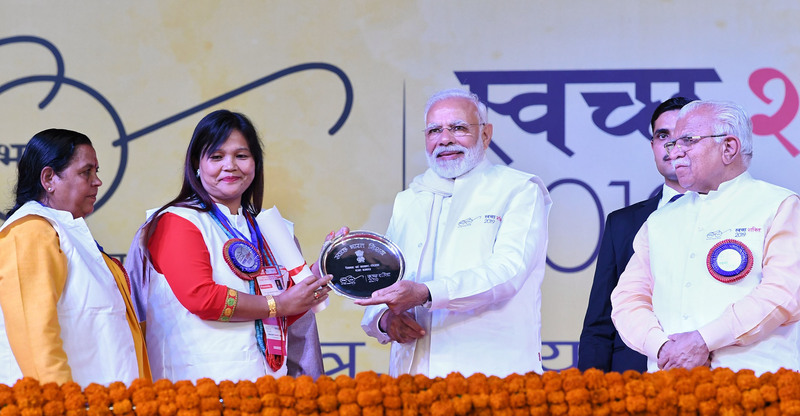 He participated in Swachh Shakti- 2019, a convention of Women Sarpanches and felicitated the women sarpanches from across the country with the Swachh Shakti-2019 awards. 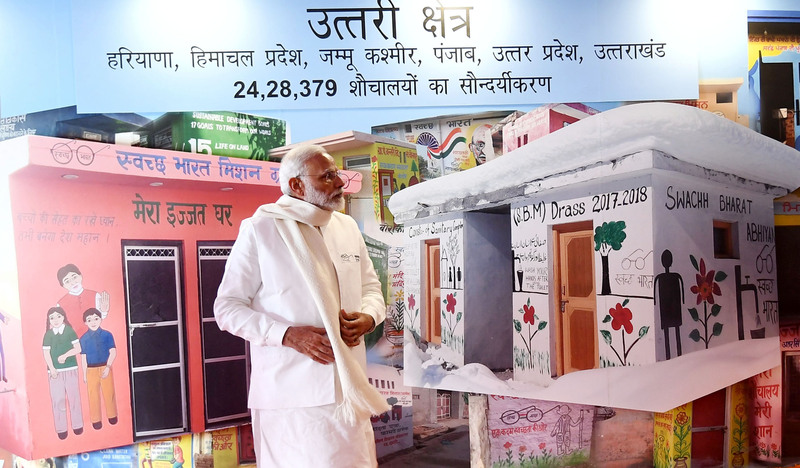 PM visited the Swachh Sundar Shauchalay exhibition at Kurukshetra. He inaugurated and laid the foundation stone of several development projects for Haryana. Haryana Chief Minister Manohar Khattar and several other dignitaries were present on this occasion. PM stated that coming together of swachagrahis from across the nation has strengthened the resolve of Swachh Bharat for a New India. Striking an emotional cord with the people of Haryana, PM said the state has been a pioneer from the launch of one rank one pension to beti bachao beti padhao and also the first beneficiary of the Ayushmann bharat scheme was a daughter from Haryana. PM said “the constant struggle of our mothers and daughters because of lack of hygienic toilets have stirred me. And I took a pledge of Swacch Bharat from the ramparts of Red Fort. In about 70 years of independence, the scope of hygiene was nearly 40%. It has reached 98% today. More than 10 crore restrooms have been created in the 4 and half years. 5 lakh villages in 600 districts have freed themselves from defecation in open. This has given them a dignified life”. PM inaugurated the National Cancer Institute (NCI) at Badhsa village in Jhajjar district from Kurukshetra itself. He stated that the Government is making all efforts to ensure health care facilities for all especially for those who can’t afford or find it costly. Elaborating the efforts of his Government, he said that number of health care facilities and institutions have been increased substantially. 21 AIIMS are operating in the country or are under different phases of rapid construction. Out of these 21 AIIMS, 14 AIIMS have been started after 2014. Now with the setting up of 1.5 lakh wellness centres and the Ayushmann Bharat, we are working simultaneously to ensure health for all. PM laid the foundation stone of Shri Krishna Ayush University, Kurukshetra, which is first of its kind in the world, providing education and treatment through ayurveda, yoga, unani, siddha and homeopathic medical systems. The foundation stone of Pt. Deen Dayal Upadhyaya University of Health, Karnal, National Institute of Ayurveda, Panchkula and ESIC Medical College and hospital in Faridabad were laid down by the PM on this occasion. Laying the foundation stone of ‘Battles of Panipat Museum’, the PM said that the battle of Panipat is a living example of ‘Ek Bharat, Shreshta Bharat’. PM emphasised that all these projects will make the life of citizens of Haryana, healthy and easy besides creating new opportunities of employment for the youth. PM appreciated that a Nigerian delegation is on a study tour to learn how the Swachh Bharat Mission has gained ground and how it can be replicated in Nigeria. The Swachh Shakti- 2019 in Haryana’s Kurukshetra was a wonderful occasion to honour the outstanding people who are making the Swachh Bharat Movement stronger at the grassroots level. In Kurukshetra today, I had the opportunity to see glimpses of some of the toilets that have been painted. I was impressed, both by the dexterity of the artists and the passion towards cleanliness.